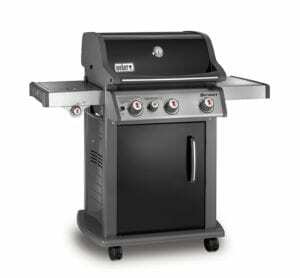 Propane gas grills are quick to light up and easy to use and the Weber Spirit E330 Gas Grill is no exception. It is undoubtedly the most energy-efficient and time-saving method for grilling and searing meat, fish and vegetables. The Weber Spirit E330 Gas Grill is made from premium quality, brushed stainless steel, this equipment is heavily guarded against fading, rusting or any sort of weathering. The 32,000 BTUs output will give you more than enough grilling power to cook up a storm for family and friends. The porcelain enameled cast iron grits along with Flavorizer bars facilitate an even distribution of the heat, resulting in a faster cooking time. Side burner with 12000 BTU’s, plenty of heat for using a Wok or saucepan. Comes with additional 7500 BTU Sear Station built in for quick searing of meat. Comes with a built-in thermometer to eliminate the need for guesswork. Sturdy trolley with castors for easy maneuverability. The burner tubes, sculpted from a singular piece of steel, are well-protected against fat dripping and rust. The side burner lets you multitask with ease. 10 year warranty on the lid and burner tubes and 5 years on the flavourizer bars and grate. The burner tubes, brushed stainless steel structure and ceramic coated grates help to ensure an even distribution of heat all over the grill resulting in optimal fuel efficiency. It also allows your food to cook evenly on the grill. Another fantastic feature of the E330 gas grill are the Flavorizer bars. These catch the juices from the meat and vaporize them to give a smokey grilled flavor your food. Any excess juices and fat that don’t get burned up flow through to the grease management system. A great feature that helps keep the grill as clean as can be whilst adding additional smokey flavor. If you love steaks, you will have a good time searing steaks on this grill. It’s dedicated sear station burner can amp up the temp to around 500 degrees. The barbecue also has Weber’s one-touch electronic crossover ignition system. Start the burners with a push of the button. On top of that, it offers multiple heat settings to suit your ever-evolving cooking needs. The temperature control valves are on the front of the BBQ and make it super easy to raise or lower the heat swiftly. There is plenty of grilling room here with a generous 424 sq inches of cooking surface area and an extra 105 sq inches warming rack. Perfect for keeping the veges warm while finishing of your meat. The castors have two front locks, a feature you will appreciate on windy days. The Weber E330 needs assembling and at just under 120 pounds you will most likely need a hand to remove it from the packaging and put together. The instructions are very clear and easy to follow, just check out the components before starting the assembly process to make sure they are all there and not damaged. Allow around and hour and a half to put this together but it may take a little longer or a bit less, depends on how handy you are with this type of thing. Once assembled you will find a nice sturdy trolley and barbecue ready for action. Be a little careful with the side burner as it can get scorching hot even at the lowest heat setting. To sum it up, I would say that Weber Spirit E-330 Liquid Propane Grill is engineered for bulk cooking. And the best part is that the manufacturers have planned the design to encourage healthy eating habit with the addition of their Flavorizer Bars. Definitely a great feature for reducing fat and adding that smokey flavor to your meal. Happy grilling! 32000 BTU from the 3 burners. Cooking area of 454 sq inches plus warmer rack. Porcelain enameled cooking grates and flavorizer bars. 4 castor wheels for easy mobility with front locks. Needs assembling – about 1.5 – 2 hours.